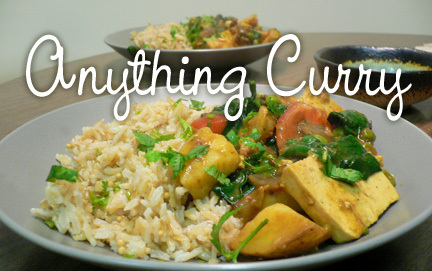 I have been in the mood for curry, and also wanted to clear out my fridge, so I whipped up this versatile and delicious curry that can use almost any vegetables you may have handy. Here I've chosen to use potatoes, tofu, peas, spinach and tomato, but you can use anything: cauliflower, green beans, carrots, cabbage, squash, bitter greens, eggplant, even hard boiled eggs! Heat 1 Tbsp ghee or oil in a pot and add spices. When mustard seeds begin to pop, add onion and stir fry for a few minutes. Stir in garlic and ginger, then the additional tablespoon of olive oil, the potatoes and peas (or whatever vegetables you choose). Add water, cover and let cook until the potatoes are tender-crisp. Gently stir in tofu, cover and let simmer a few moments. For extra flavour, heat 2 Tbsp ghee or olive oil in a small pan and add either 2 Tbsp curry paste or 1 Tbsp each cumin powder, coriander powder, plus salt and hot pepper flakes to taste. Stir into the curry at this point, along with spinach and tomatoes, if using. Let spinach wilt, then serve immediately. Delicious on brown basmati rice (try cooking with bay leaves), noodles, or naan bread. Serves 4. This looks delicious. . . now I know what to do with all those leftover veggies in my fridge! Can't wait to try it.